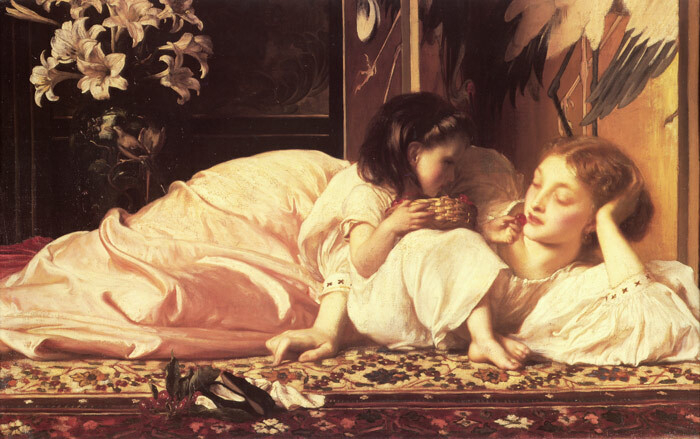 Mother and Child is one of Leighton's most popular and famous paintings, and deservedly so. It confirms the impression that the decorative smaller paintings produced by Leighton in the 1860s and 70s are the best things he did. In this painting the artist successfully combined a number of disparate, difficult to reconcile, facets of Victorian art. Mother and Child is a sentimental celebration of family life, it is highly decorative, with the rich colouring of the carpet, and it gives an overall impression of peace and serenity. The shadow on the child's face is masterly, and the soft-focus on the face of the mother is just beautiful. The whole comes together in a supremely decorative picture. SPECIAL NOTE : The painter will make the reproduction as close to the original oil painting as possible. If you want your painting to alter from this likeness, please email us and " Mother and Child, c.1865 " will be reproduced according to your special requirements.